PITTSBURGH — Another game. Another goal. James Neal‘s first period tally sparked Pittsburgh to a 3-1 win over Montreal Thursday night and tied him with Phil Kessel for the NHL goal-scoring lead at seven. Neal’s quick wrist shot from the slot initially beat Montreal goalie Carey Price, but it rang the post before ricocheting off Price’s back and finally dribbling into the net. “When things are going good you get bounces like that,” Neal said after the game with a smile. He’s been saying that a lot lately. Neal’s hot hand and touch of luck has made the absence of Sidney Crosby (concussion), Evgeni Malkin (knee), and Tyler Kennedy (concussion) a little easier to stomach for the Penguins. It’s this type of production that fans and GM Ray Shero hoped to see from Neal after he was acquired from Dallas at the trade deadline last season. Neal scored 21 goals in 59 games with Dallas at the start of last year, but added just one to that regular season total after the trade. When a young player is traded away from the only organization he’s ever known it can take time to adjust to a new team on the ice. Different coaches, new systems, unfamiliar faces in the locker room. What we often forget to consider is the off-ice impact a trade can have on a 23-year-old as well. Neal said he’s made Pittsburgh a home and having a full training camp with the team has played a big role in his hot start. Gaining a full understanding of a system as complicated as coach Dan Bylsma’s can be vital to the success of a goal scorer. At the NHL level, an extra split-second thought can be the difference between getting a shot on goal or having it blocked. Instead of thinking and making decisions about where he should be on the ice, Neal is now simply reacting. Another way for a goal-scorer to find success is to head to certain areas of the ice that are so familiar, he can almost shoot with his eyes closed. Focus on Neal for an entire shift in the offensive end and you’ll notice him heading to the same two spots on the ice: the top of the left circle and the bottom of the right circle. Coach Dan Bylsma pored over hours of film this offseason breaking down every single goal Neal has scored in his NHL career. Which leads to the most basic reason for James Neal’s success: he’s shooting the puck more than ever. This season is still in its infancy, but Neal is averaging almost 1.25 attempted shots per game more than he did last year. One of Neal’s current teammates knows first-hand how difficult he can be to contain when he’s shooting the puck often and with confidence. “I know him well from playing in the West [Conference] and in the same division for a long time,” said defenseman Zbynek Michalek, who spent five seasons with the Phoenix Coyotes before coming to Pittsburgh last summer. 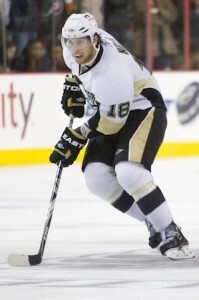 Can James Neal keep it going or is this just a streak of good luck? His high shooting percentage should regress back in line with his career average over time, but one advanced statistic shows that Neal’s recent success may not be a fluke. “To calculate PDO, you simply add together a team’s even-strength shooting percentage and even-strength save percentage, multiplied by 1000 to give us a nice looking number to work with. For the entire NHL, the PDO number must equal 1000, because every shot is either a goal or a save. Wagner goes on to describe how we can apply the PDO methodology to individuals by using the team shooting and save percentages only when a certain player is on the ice. Heading into Thursday’s games, Phi Kessel had a PDO of 1178 indicating an unsustainable hot start for the sniper (last year’s NHL range for individuals was 934 to 1062). James Neal’s even-strength PDO heading into Thursday was 978, showing maybe even potential for improvement. He won’t maintain his current 64-goal pace, but it’ll be interesting to see what happens to his numbers after Malkin and Crosby return to the lineup full-time. Neal is no stranger to fast starts. In fact, he could probably be nicknamed ‘Mr. October’ based on how he began the last three seasons in Dallas (see graphic to the right). But Stars coach Joe Nieuwendyk said last year that Neal needed to find a way to produce more consistently in order to take his game to the next level. After games, Neal is constantly asked by reporters how he and the Penguins have found ways to be successful without help from their injured stars. He usually offers the cliche lines about working hard and ‘playing their game’, but truthfully, these are the only Penguins Neal has ever known. He didn’t win a Stanley Cup with this group in 2009. He watched Sidney Crosby torch the NHL with 66 points in 41 games last year on television like the rest of the world. For now, he can only dream and wonder. Neal played three games on Evgeni Malkin’s wing earlier this season and showed good chemistry with the creative Russian. But despite the early season chemistry with Malkin, Neal was supposedly acquired from Dallas to play with Sidney Crosby. Bylsma has mentioned on a few occasions this fall that he’d like to see what Crosby can do between two pure shooters in Neal and Chris Kunitz. Time will tell whether Neal cools off or he can turn his first full season in Pittsburgh into a career year. Neal’s efforts have been appearing on the highlight reels and scoresheets every night so far, but he admits that his goals have only been one aspect of the team’s success. Mike Colligan is the Pittsburgh Penguins correspondent at TheHockeyWriters.com and an NHL analyst at Forbes SportsMoney.